Nomiaruki is a biannual sake festival that takes place in the town of Suwa in Nagano. This festival began in 1998 and has been gaining traction ever since. 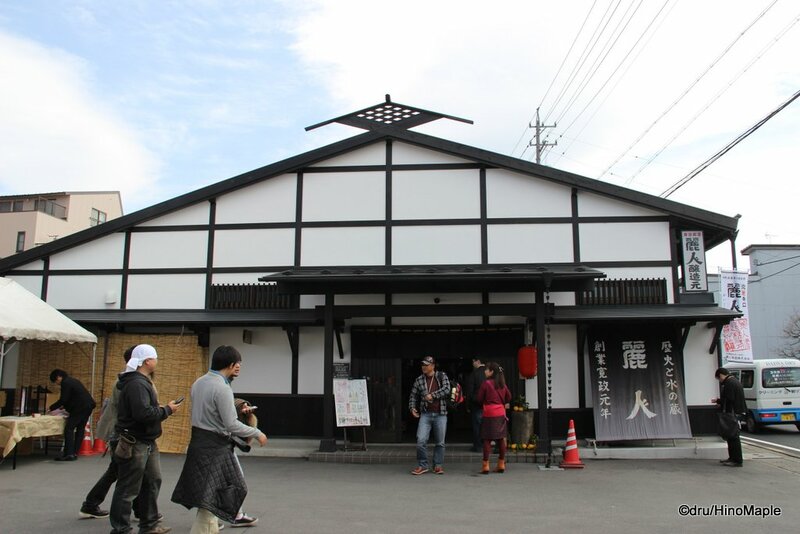 The festival started off small enough with the 5 sake breweries of Suwa getting together to promote themselves properly. I learned of this event from a regular festival goer who said that each event has been getting bigger and bigger for the last several years. You can see some of the pros who have been around for several events and you can tell who are new to the event. The Nomiaruki is a great festival and just a stone’s throw away from Tokyo. It can easily be done as a day trip, but be aware that if you are driving, there is almost no chance you’ll be able to go home on the same day unless you have a designated driver. If you go on a day trip you may also miss out on the great sights of Suwa, but that will be a future post. The first step to the Nomiaruki is to get there. The festival is located just down the street from Kamisuwa Station. It is on the Chuo Line and both the Azusa and Super Azusa trains stop there. I was surprised by this but after learning more and more about Suwa itself I am no longer surprised. Suwa is famous for having Nagano’s largest lake and an annual fireworks festival that is one of the best in Japan. Suwa Taisha is also nearby but not really close to the Nomiaruki. 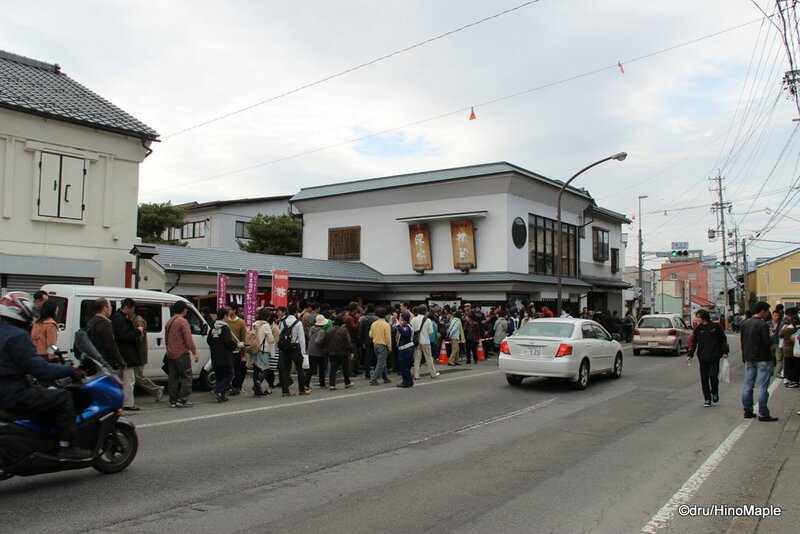 It takes around 2-2.5 hours to get to Kamisuwa Station and then all you have to do is walk to the festival. When I arrived, they were all set up at the station and ready to help people once they got off the train. I was a little confused as to how to get out of the station as there is only one exit in the entire station and there were signs saying you couldn’t go out the west exit from one set of stairs. Coming from Tokyo, you are so used to stations having multiple exits that you sometimes forget that you are in a rural area and the train stations usually only have one exit. Once you do exit the station, just look around and you’ll easily see what you need to do next. The Nomiaruki is not a free event. 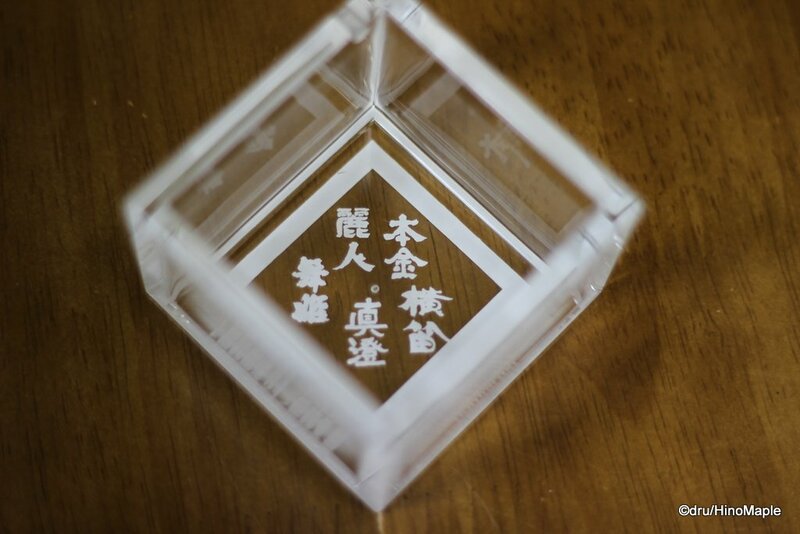 You pay 2000 yen (as of the spring 2014 edition) for a small cup, in my case a clear plastic box. You also get a little information about where the event is taking place and it includes a map. You also have an option to buy a lanyard for your cup but that is an extra 300 yen. If you have your own lanyard, you can use that. There is a large table set up outside the station entrance and once you purchase your cup, all you have to do is head to the festival area and start drinking! Nomiaruki (呑みあるき), from what I can tell is a combination of drink and walk. 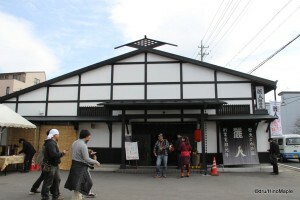 The 5 sake breweries are located about 600 metres from Kamisuwa Station. It is very simple to get to the breweries as all you have to do is head to the main road and turn right. Keep going straight and you’ll see the first brewery on your left. The festival spans all of the 5 breweries, which span 400 metres. You start with Maihime before you come upon Reijin. This is followed by Honkin and Yokobue and at the end of the strip is Masumi. All of these breweries range in size from small to large but all of them pride themselves on what they can brew. My impression lead me to believe Masumi is the largest followed by Reijin. Yokobue came in third followed by Maihime and Honkin. In between each of the breweries, you can enjoy some food that had been set up but the main food area was between Yokobue and Masumi. Across from Maihime is an empty lot that was used for washrooms and free samples for local items. I was lucky as they had free tissues and wet tissues which proved to be very useful for the event. The area between Yokobue and Masumi was not very traditional and a lot of the food felt catered to wine lovers rather than sake, but it was still really nice. Masumi had the largest public area, including some food, so you can easily enjoy your time there as well. With this festival, all you do is drink and walk for several hours, which is probably why they call it the Nomiaruki. It is great fun and by the end of the day you can hear the boisterous crowd having a great time. The festival starts at 1pm and ends at 6pm. I didn’t last till 6 but I came close. At the start, things are very busy as people want their first sip of sake. Once the first group of people are done, things are a lot easier. Some places are always busy, such as Yokobue, Maihime, and Honkin. This is more to do with a lack of space rather than being very popular. As the day continued, and the drinking continued, I walked from one brewery to the next and back again. I was almost aimlessly walking around and had a great time doing so. The walking helped keep me sober enough as if you are very drunk you have to be very careful. The breweries are located on a somewhat busy road and while the cars and trucks don’t move very fast during the festival, it is very easy to accidentally get hit by a car. If you can’t walk straight enough to stay within a 1 metre side of the road, you may want to reconsider taking a break. The food at the festival was a little peculiar. I was expecting some local treats and a lot of Japanese food but I was surprised to see more western styled food. When I was at Reijin, they had free tonjiru, pork soup, if you filled out a questionnaire. I did so before I even had a drink and just lied about what the taste was like. The tonjiru was unique as they added some sake masu to the mix. Masu is the by-product of sake and made the tonjiru more interesting and unique. They also had small glasses of beer for 100 yen. They had all 3 types of beer available, a Stout, Altbier, and Kolsch. The beer wasn’t the best in the world but it wasn’t bad either. For 100 yen, I won’t complain. Then there was the deer. I don’t remember ever eating deer and when I heard they had deer, I had to eat it. I tried two different varieties. I had a deer tsukune with a little mustard and a deer steak that was on a stick. Basically it was yakitori, rather than yakishika (1). Both were pretty good but trying to describe what it tastes like is a little hard to do. It wasn’t as gamy as I had thought it would be, but it definitely had a stronger smell. Finally, I had a nice pizza from a pizza truck. 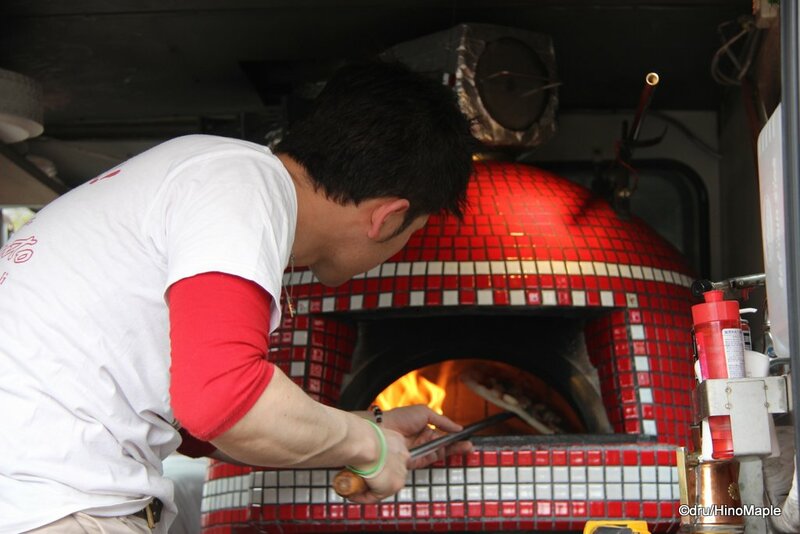 I’m not sure what the pizza truck does on other days but they were set up at Masumi with a wood fired oven and making pizzas nonstop. The chef was only able to do one pizza at a time and at around 2, the wait time for a pizza was well over 30 minutes. We decided to place an order for 3pm, an hour later, rather than waiting at the same place without knowing when it would arrive. The entire festival was great. I would love to go again as the sake was delicious, the atmosphere was fun, and the experience was unforgettable. It is something that anyone with a love of sake should do. While I think the festival is great, I also think it is not something an aficionado would truly love. 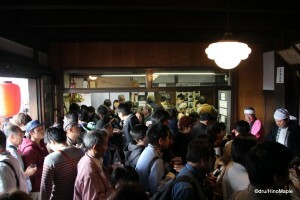 The festival is very busy and trying to really taste the sake and notice the subtleties is very difficult in such an atmosphere. If you are looking to have a little fun with your friends, this is the best place to go. If you spend a night, the next day they are all open again and you can revisit them and get free tastings. Most of the time the tastings are free but you only get a tasting. Enough for a couple sips here and there. It made purchasing bottles of sake for home a lot easier though. They also have a special stamp rally if you decide to go on a non-festival day; but I’m not sure what kind of coupon you do get. Whether you go to the Nomiaruki and spend the night or not, the festival was a complete joy and I can’t wait till I go again. PS: Rurousha: Check out the link below. They have a book fair! 1: Yakitori is translated into “grilled chicken”. Yaki means grilled. Shika is the Japanese word for deer, hence “Yakishika”. 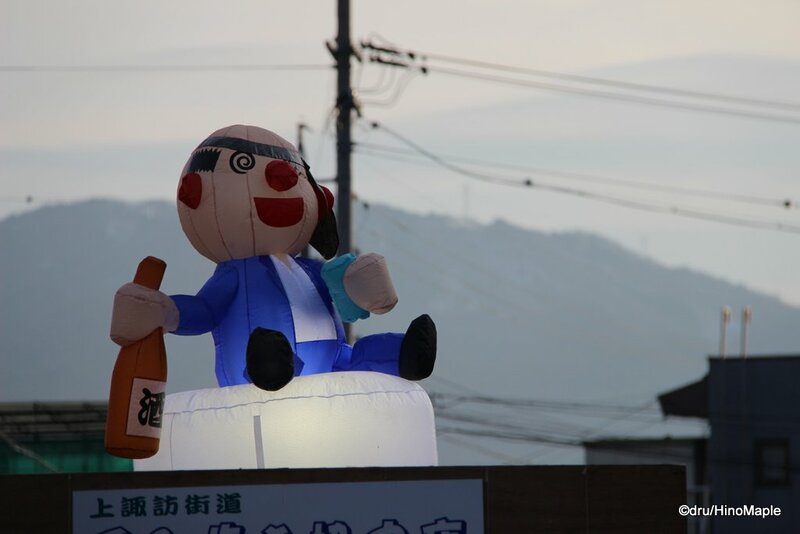 This entry was posted in Chubu, Festivals and tagged beer, Chuo Line, Honkin, japan, Kamisuwa, Kamisuwa Station, Lake Suwa, Maihime, Masumi, Nagano, Nagano-ken, nihonshu, Nihonshu Festival, Nomiaruki, Reijin, sake, Sake Festival, Suwa, Suwa Lake, Suwa Roman, Suwa Roman Beer, Suwa-ko, Yokobue by Dru. Bookmark the permalink. “Nomiaruki (呑みあるき) is a combination of drink and walk.” Aha, so THAT’s what we did! PS: What a great name for a blog. Or a book. Too late. Already used by them. Not sure of the copyright problems… … Although in English it might work.